Is Madden 17 finally a complete product? UPDATE OCTOBER 23, 2016: LATEST PATCH AND/OR TUNER HAVE PRACTICALLY RUINED THE GAME FOR ME. Sliders don't seem to improve the experience at all. In fact, certain sliders (like CPU QB Accuracy and CPU Pass Blocking) don't seem to have any effect at all anymore. I am tempted to rewrite this review with a much lower score (Somewhere in the range of a D or D-), but I'm hoping that EA will fix the problem - or at the very least, that deleting the most recent Tuner data will resolve some of the issues. Sadly, I don't think it's possible for me to re-download the first tuner data. This is a shame, since that one actually did fix some genuine problems the game had at launch. DO NOT DOWNLOAD PATCH #2 OR TUNER #2! Electronic Arts has supposedly spent the last three years or so rebuilding Madden from the ground up. Because of that, the past few years' games have felt very incremental, and somewhat incomplete. It was obvious that there were still major holes in many facets of gameplay. Personally, I would have preferred that EA just take a two or three year hiatus in order to hold off on releasing a game until it was actually complete. I'm happy that it seems like we're finally getting a "finished" version of EA's vision of a "next gen" Madden game, and I was curious to see if it would live up to expectations. By their own admission, EA has finally rebuilt the final few phases of gameplay that still used predominantly legacy code (e.g. special teams and the football itself). For the first time in a long time, it feels like Madden can be approached and reviewed as a complete retail product rather than one step in a long-term incremental beta process. Is it worth the wait? We'll, first impressions let it down a bit. Much like last year's game, the introduction and tutorial for Madden 17 seemed like a pointless waste of time that misrepresents the actual content of the game with its frequent cutscenes and dialogue from players and coaches. I'm not sure who these scripted gameplay intros are intended for. I would expect that new players would likely be confused and unsure what to do, resulting in failing the intro without any clue what they did wrong or what they were supposed to do. Experienced players, on the other hand, are probably just annoyed with the lack of control in this sequence. The inability to skip the cutscenes only makes repeat playthroughs (if you care enough to try to actually beat the scenario) feel tedious, as you'll have to sit through more cringe-worthy dialogue. EA Sports / Tiburon isn't Naughty Dog, and so writing dialogue and directing voice actors are not the studio's strong suits. About the only thing that this intro sequence does is highlight the new commentary team, which is actually pretty good. Despite the blocked field goal in the intro being an un-playable cutscene, special teams was one of the primary areas of focus this year. It's an area that's been mostly neglected since the analog kick meter was introduced back around 2007. 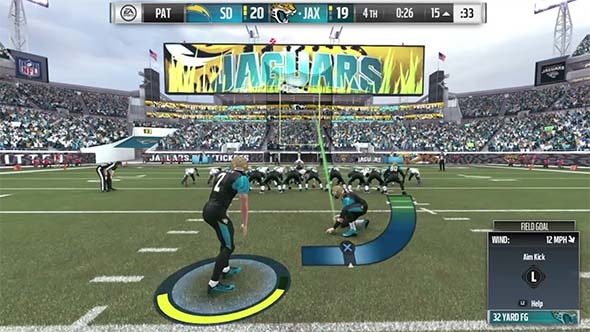 And what was the innovation that EA decided was necessary to bring their kicking game into the next generation? Well, actually, they decided to bring back a kicking meter that works almost identically to the older PS1 / PS2 era games. You start the meter charging by pressing X, then press X again to set the kick strength as the meter fills, then press X again to set the kick accuracy as the meter returns to the bottom. Nothing new here. The "new" kick meter is basically a return to the older kick meter. However, you now have to hold the analog stick to aim the kick prior to starting the kick meter. If you let go, the kick trajectory will snap back to the default. This does require a bit more dexterity than either of the previous kick meter systems ever needed, but it's still fairly easy once you get used to it. Though, EA could maybe loosen up the accuracy window for online games because any amount of lag makes the kicking game virtually impossible. You also have to be more careful with timing your kicks, as the game and play clocks both continue to tick while the kick meter is charging. Not sure if this is a bug or a feature... So be careful that you don't wait too long and give yourself a delay of game (or let the game clock expire before) you get the kick off.